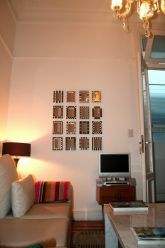 This beautiful apartment, is located in Avenida Rivadavia, just one block away from Callao. Next to the magnificent Congress Palace, and it's square. The area is centric, walking distance to the Theater district, Barrio Norte, Recoleta, San Telmo, and Avenida de Mayo. Full of restaurants, bars, and main subways. The building is a landmark of Buenos Aires, designed by world famous Mario Palanti. The apartment has a large living room with a large sofa, and a classic ceiling-lamp. One bedroom, separated dining-room, full kitchen, full bathroom and a long hallway connecting all the apartment. Cable TV/DVD (Flat TV 19"), Phone (local calls without charge), Internet, Air conditioner, gas heater. Great lighting and silent place. 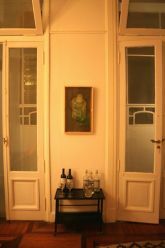 Perfect place for a comfortable stay and a stone´s throw from any central place and with excellent means of transportation. The interior design and decoration was made by New York interior designers. Deposit: 1 week rental = 1 week safety deposit. Near to: Museums, Churches, Discos, Parks, Pools, Change Houses, Cinemas, Restaurants, Stores, Banks, Wash Stores, Bus Stop, Theatres, Coffee Stores, Internet Coffee, Gyms, University.